During our trip to New Orleans, we made a trip over to the Garden District to have dinner with our parents. They both requested one thing - authentic NOLA cuisine. Well on a Saturday night with no reservations, I found myself stressed out beyond belief. Thank you to the powers of Yelp and UrbanSpoon, I located a home cooked joint a mile from their hotel called Joey K's Restaurant. Both review sites highly recommended this place. From the moment we walked in, I knew we were in for a treat. Cute doesn't describe it. Then across the wall, I see a the huge platinum hair and grin of Guy Fiere. We accidentally stumbled upon a restaurant that was featured on Diners Drive In's and Dives. Now I am really excited BUT one thing stood in the way. This was the night before the Rock n Roll New Orleans Half Marathon. I am "supposed" to be carb loading. Yet, I wanted nothing to do with pasta. So in true NOLA style, I relied on beer as my carbs and ordered whatever I wanted. Dangerous, yes....but I went with what I wanted, not with what I am supposed to do. I ordered the one thing I knew I shouldn't - Fried Chicken. It was highly recommended in the reviews....yet you are not supposed to eat like this on race eve. There were 6 people in our dining party and more than half of us ordered the fried chicken. Although it wasn't what I was supposed to eat, I was very happy with my decision. Seriously, some of the best fried chicken I have ever had in my life. The mashed potatoes on the other hand left a lot to be desired for (I specifically ordered them for the carbs and didn't eat more than one bite). If that wasn't unhealthy enough, the onion rings were one of the must haves on all of the review sites. We saw the bad boys the moment we walked in. Oh my god. Seriously, oh my god. I cannot express how great these onion rings were. My boyfriend ordered the Red Beans and Rice with sausage. The red beans and rice was very good but the problem with this dish was we consumed way too Cajun sausage prior to this night. Cajun sausage overload. My Dad got the item that Guy tried above, the Shrimp Magazine Pasta. This dish was named after the famous Magazine Street in the Garden District. The specialty dishes at Joey K's are named after the more popular streets in the district. This dish featured large butterfly shrimp lightly floured and pan fried, then sautéed in olive oil, garlic, artichoke hearts, ham and green onions, served over pasta. In hindsight, it is what I should have ate the night before the race, especially when I tried it. Excellence in every bite. 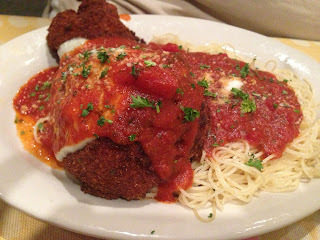 Speaking of dishes I should have ate, Gabe's Mom ordered Chicken Parmesan and Pasta. When we were ordering our meals, Gabe made the comment he wanted Spaghetti and Meatballs and I looked at him with a strange face - we're in NOLA......spaghetti and meatballs? Our server told us it was great. One bite of her pasta and Gabe was sulking - it was really good. Not that his dish wasn't fab. Her dish was probably the one that we should have been eating the night before the race. Joey K's was a good step away from the busy French Quarter. It was a fun atmosphere and everything we had was pretty good. Believe it or not, with the amount of non healthy foods and alcohol I consumed prior to the half marathon, I actually did OK. It may have something to do with my body being used to running half after half after half, but we did good considering our week coming up to race day. A piece of advice - if you are interested in running this race, or any race in a party city, do the race, then take the vacation. Learn from my mistake!